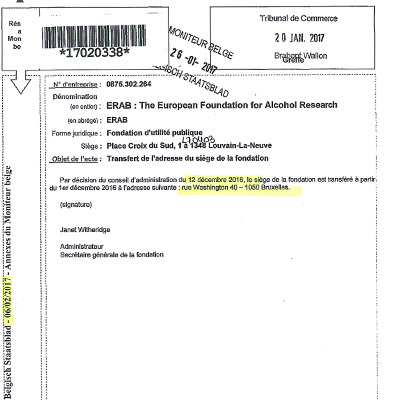 The by-laws were approved by the Belgian Ministry of Justice under the law of 27 June 1921 on domestic non-profit associations, international non-profit associations and foundations. The constitution of the Board of Directors, made up of a majority of public members and a minority of industry members, follows closely the format of the ABMRF/The Foundation for Alcohol Research. Click here for a copy of the By Laws as approved by the Royal decree of April 12th 2005, amended on 18th February 2010 (published on 3rd March 2010 in Moniteur belge) and amended on 15th February 2016 (published on 1st April 2016 in Moniteur belge) and 3rd November 2016 (published on 26th January 2017 in Moniteur belge). ERAB is a foundation of public utility (a charity), registered enterprise number (and VAT number) 0875.302.264. The members of the Board of Directors (apart from the Chairman) and all the members of the Advisory Board are expected to work pro bono.